What is complexity? What does it mean for something to be complex? This term is thrown around a fair bit in apologetics, but it isn't very well understood by many who employ the term. It's often contrasted with simplicity, which is a mistake, because complexity and simplicity are not on the same spectrum. In this post, I want to pick apart what it means for something to be complex and to deal with some of the apologetic that's erected concerning complexity and the underlying fallacies applying committed in all such apologetic. As is often the case, much of the wibble on this topic arises from not fully grasping what the term means so, as always, let's unpack it. There are quite a few ways that the term 'complex' is used and, while they're not directly equivalent, they are closely related. For example, we might talk about a complex of buildings, or a psychological complex. At it's most basic, the term simply means 'composed of parts' from the Latin 'com-' (together with) and 'plectere' (braided, woven). Essentially, something is complex if it comprises two or more parts and it displays behaviour that is emergent from the combination. The term can also be reasonably applied to any system that's difficult to predict, and again this is related, because unpredictable systems are almost universally made up of multiple parts. Let's look at an example. I've chosen this example specifically because it's an incredibly simple system exhibiting complex behaviour, which should highlight why placing simplicity and complexity on the same spectrum is a problem. As we can see, this is a simple double pendulum. It is composed of only two moving parts. Properly, this system is chaotic. Chaos is another term that is often confused because, in the vernacular, it simply means 'disordered' but, in scientific jargon, it means 'sensitive to initial conditions'. This is again one of those situations in which the oft-maligned 'semantics' is incredibly important, because while it could reasonably be said that this system exhibits some disorder, disorder isn't a necessary outcome of chaos, in exactly the same way that disorder doesn't necessarily result from entropy, as we discussed in an earlier post. I'll be covering chaos in a later post, but I highly recommend the excellent Chaos by James Gleick in the meantime. The point to take away here is that complexity is often conflated with complicatedness, and that this is an error. As is all too clear from this example, an extremely simple system can exhibit complex behaviour. Indeed, this system is 'irreducibly complex', and this is often erected as a problem for evolutionary theory. It isn't, but to understand why requires a little more work. Apologetic regarding irreducible complexity can actually be traced to Darwin, and his seminal work, On the Origin of Species. This has been leapt on by creationists, most notably Michael Behe, who has essentially redefined it in a subtle way for the precise purpose of attempting to debunk evolution, a truly futile endeavour, not least because evolution has been observed occurring. Behe has built a massive castle in the air around this idea, in a spectacular commission of a fallacy I've termed argumentum ad elbow-joint-of-the-lesser-spotted-weasel-frog, after an example employed by Richard Dawkins in The God Delusion. Behe, in his employment of this fallacy, has hit upon several examples of what he deems 'irreducible complexity', but there are several reasons why they have all failed. As always, actually looking at examples should prove instructive. Let's start with the favourite, one highlighted by Darwin himself. If you paid attention there, you'll have noted the ellipsis, highlighted in red between 'degree' and 'reason'. I've highlighted that for a specific reason, which I'm going to come back to later in the post, because it deals with another fallacy common among apologists. Here, though, we just want to look at the example of the eye, which is a favourite organ that's allegedly irreducibly complex. The claim is that the human eye 'with all its inimitable contrivances', couldn't have come about by a process of cumulative construction over generations, because part of an eye would be useless. It should be fairly simple to spot the flaw in this, of course. The eye, complex as it is, is actually reasonably simple in terms of the core principles on which it operates. We have photoreceptor cells in our eyes, containing proteins known as 'opsins', which are sensitive to light and mediate the conversion of photons into electrical impulses, in a process known as phototransduction, that are in turn translated by the brain. This is a simplification, of course, and the actual signal cascade is itself fairly complicated, but based on these very simple principles. The brain, and indeed all neurological systems, are rooted in the same electrochemical foundations, and these are universal in the biosphere. Humans have a trichromatic (three-colour) system that translates photons of different frequencies into red, green and blue, much like your television. Other organisms have bichromatic (including some humans) or tetrachromatic (four-colour) systems. Each photoreceptor cell needs multiple photons of a certain energy in order to trigger. For more on photons, energy and colour, see previous post Give us a Wave, which is pretty cool and has lasers in it. We can start with a really simple system that will give us some insight into what use 'half an eye' might be. Here's the beginning of a progression of various prototype eyes so we can see how the whole process might work. First, a simple cluster of photoreceptors. It might be difficult to see how this can provide any sort of advantage, but remember that, in the land of the blind, the one-eyed man is king. Indeed, in that simple statement is the key to evolution by natural selection. As we discussed in the earlier post dealing with observations of evolution, the key to understanding the phrase 'survival of the fittest' is that the organisms that are involved in the competition for resources are almost always the same species (and for some of those resources, always). Now let's look at what happens if we add a slight complication. In this instance, we have exactly the same cluster, but now we have a bit of curvature. With just this tiny modification of our cluster, we can see that we have some directional sense, in that this configuration can tell us vaguely where light is coming from. This is the same configuration but with a light source added. As can be ascertained fairly easily, this configuration, because it has curvature, can get some sense of the direction the light is coming from. It's worth noting that this is unlikely to occur in a single generation. This tiny modification could take many, many generations, with minuscule, almost imperceptible modifications from the initial cluster of photoreceptors, which itself would have taken many generations to evolve from the most basic of light-sensing proteins. Over more generations still, this curvature might become more and more pronounced, with better and better directional sense. We can see that this complexity, from simple photoreceptors, on through indentations getting deeper, then with a film forming over the eye socket and the cavity filling with fluid, the aqueous humour, carrying on through the formation of a rudimentary lens, and then more and more tiny, incremental improvements, until we arrive at the modern eye. I won't belabour this point any further, but I will pop a lovely video in at the end of a youngish Richard Dawkins in a classic edition of the Royal Institution Christmas Lectures from 1991. The Royal Institution Christmas Lectures series is one of the greatest treasures of the scientific world, and I really can't recommend it highly enough. Instituted by Michael Faraday in 1825, these lectures are held at the famous lecture hall at the Royal Institution each Christmas, aimed at children. The edition I'll show is episode 3 from that year, entitled Climbing Mount Improbable. I also highly recommend Dawkins' book with the same title, in my opinion his best book, and one which, properly read with an open mind, comprehensively demolishes all creationist objections to evolution. That said, let's move on, and deal with the other darling of the cdesign proponentsists*, the bacterial flagellum. As the name suggests, the flagellum is basically a whip (the word 'flagellate' comes from the same root). In some bacteria, this is a wonderful bit of evolution in action. It consists of a whip-like tail, driven by what can only be described as a motor, even to the extent that some of the components are named after their mechanical counterparts. As far as I'm aware, this is the only true freely-rotating motor in nature, and it really is an incredible bit of engineering. This is what a cross-section looks like. It's really easy to see why creationists have singled this out as an example of irreducible complexity. A naïve appraisal of this would certainly enforce the idea that it must be designed and, without proper study, it looks an awful lot like it fits Darwin's criterion and offers a thoroughly robust challenge to evolutionary theory. This is one of those rare occasions in which 'creation science' has paid dividends because, since the erection of this as an example of irreducible complexity sufficient to undermine evolutionary theory, the flagellum has been extensively studied by real scientists, as opposed to creationists in stolen lab coats. Here, I want to share some of the findings of those studies. The flagellum is used to give the bacterium motility. The motor rotates, and the flagellum spins around like a little propeller, giving the bacterium motive control and allowing it to propel itself. Not all bacteria have flagella, however. Some bacteria, especially gram-negative pathogenic bacteria such as Salmonella typhimurium, have other mechanisms in the same place. These mechanisms, known as secretion systems, are employed in infecting host organisms. 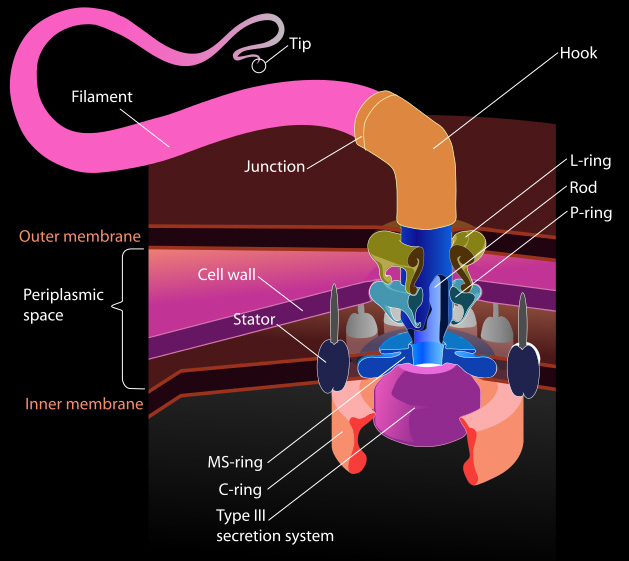 In this instance, the Type III secretion system (T3SS), on of five known systems with the same function, contains everything from the rod on down. In the case of the T3SS, the rod is actually a needle, which is what's used to secrete effector proteins into the host. The flagellum, it appears, has been constructed on top of a previously existing structure that once had a different function. Now, it may well be that this was not a direct transition from T3SS to flagellum, and that other functional structures were in place in the interim, but it's pretty clear from the morphology that the T3SS was the precursor to the flagellum. One of the unresolved issues is that the C-ring in the flagellar motor has not been observed in any T3SS. There's an important point to be noted in there, the idea that a functional mechanism can be constructed on top of a previously existing structure that itself had function. It might seem strange that this could happen but, as always, the devil's in the details. One of the major underlying themes in evolution is economy. It's known, for example, that some species of cave fish that live entirely in the dark have not only lost use of their eyes but, in many cases, their eyes have stopped being synthesised. The same can happen with any previously functional structure and, of course, this can leave the way open for the synthesis of new functional structures that utilise part or all of the pre-existing structure for new purposes. Further, we know from embryology that there are transient structures that grow specifically so that functional structures can grow on top of them, to be removed later in the embryological process. From a mechanical perspective, this is like a 'centring', used in construction of arches. As it happens, though, the bacterial flagellum has been categorically demonstrated not to be irreducibly complex. In recent experiments, the flagellum was subjected to deconstruction, including the axle, and it still worked! Further, there has been work done on the actual genes that code for the requisite proteins in flagellar synthesis, particularly two of them, namely FliL and FliH. It appears that knocking out the FliL gene buggers up the flagellar synthesis. But, and you'll love this, because it shoots the irreducible complexity nonsense in the foot, if you knock out the FliL and the FliH at the same time, flagellar synthesis resumes! I'll cite the studies at the bottom. I think we've spent enough time on the flagellum so, before I move on to the sting in the tail, I thought it worth noting that we've already touched on an example of irreducible complexity in our earlier outing on evolution linked up the page, in the form of Richard Lenski's long-term E. coli experiment. We talked about how, in that experiment, although the E. coli already had the ability to transport citrate, making it available as a source of subsistence, it wouldn't do so in an aerobic environment. The mechanism that allows it to transport citrate in an aerobic environment is manifestly irreducibly complex. If you remove any of the parts, it stops working. Each of those parts, just as in the example of the T3SS and the flagellum above, had an alternative function prior to becoming part of the function of aerobic citrate transport, and this was observed evolving. Finally, and this is the bit that really nails the whole irreducible complexity canard to the wall (no ducks were harmed in the writing of this article), while no truly irreducibly complex structures in sensu Darwin as cited above, irreducible complexity in the sense that Behe uses the term and as described in those examples cited above is actually a prediction of evolutionary theory. Yes, you read that right. Evolutionary theory predicts that such structures will arise via mutations and natural selection. This was first formalised by Hermann Joseph Müller some thirty years before Behe was even born, in a process that has since come to be known as the Müllerian Two-Step. It works, simplistically, like this. Now, there's one last thing to deal with, namely that ellipsis in red in the second of those quotations from On the Origin of Species. An ellipsis is used in text to denote missing text. In this instance, I used it to truncate the passage and remove an interjection that made the quoted passage longer than it needed to be and added nothing useful in terms of the discussion, but it's worth noting that, when you see this in a creationist quotation of a scientist, it should raise a red flag. Indeed, whenever you see it, be ready to check the source, especially if the quoted text seems incongruent with other things that the quoted scientist has said, or where it doesn't gel with their general position. There's a common practice in apologetics - and always remember that science-deniers treat science as nothing more than a branch of apologetics (often committing a fallacy known as the fallacy of stolen concept, which I'll cover in some detail soon) - known as 'quote-mining'. This is a particularly pernicious practice that constitutes a spectacular breach of the ninth commandment. Indeed, it breaches that commandment directly, by bearing false witness. This practice entails taking something somebody has said and removing portions of the text so that it looks like they've said something else, often directly contradicting the original intent. If you look at the quotation from Darwin only up to the ellipsis, it looks an awful lot like he's saying that his theory seems absurd. Creationists will often omit what comes after it, in which Darwin categorically states that he doesn't think so. Doing this to Darwin's work is particularly fruitful for creationists, not least because Darwin was so incredibly diligent in his research that, when everything was in place, he systematically went through his theory and erected all the possible objections to his theory, precisely for the purpose of knocking them down and showing that said objections were not substantive and were countered by the evidence. In short, if you see something quoted that seems to counter what a scientist has said, check it, and especially if you see an ellipsis. I'm not suggesting for a second that all instances will be dishonest misrepresentation, but it occurs so very often that it's something to watch out for. The Talk Origins website has been running a quote-mine project for many years, and has a nice collection of expositions of this horribly dishonest practice. I'll pop a link in at the bottom. Thanks for reading. Nits, crits and comments welcome as always. *This, which looks like a typo, is in fact a typo. From a famous book written by Percival Davis and Dean Kenyon. In the original edition, the book had reference to 'creationists'. At the time, creationists were trying to generate some distance between their ideas and the idea of god, so that their pseudoscientific ideas wouldn't fail the Lemon test, a precedent in ensuring that separation of church and state was maintained in line with the establishment clause of the US constitution. This typo in a later edition arose because when the word 'creationist' was replaced with 'design proponents', something went wrong at the typesetters, leaving 'cdesign proponentsists' in its place. I should add that it's worth checking out AronRa's Foundational Falsehoods of Creationism on his Youtube channel. This is also now available for pre-order in book form, and I recommend it.